The work you put into this dinner will pay off in spades: Not only is the pork delicious, it makes a large batch sure to leave you with leftovers. Prep the pork in the morning, let the slow cooker do all the work during the day, and simply cook the rice and assemble the bowls in the evening. And, of course, enjoy! Paleo: Swap rice for fresh spinach or lettuce. Omit beans, cheese, and sour cream. 1. To make the rub, mix the Kosher salt, black pepper, garlic powder, onion powder, smoked paprika, and oregano together. 2. Coat the bottom of a large frying pan with vegetable oil. Heat to medium high. A pan that is not non-stick works best for this. 3. Dry the pork roast with paper towels. Cut off any large chunks of fat on the outside of the roast. Generously apply the rub to all sides of the roast. 4. When the oil is good and hot (you should be able to smell it), brown the pork roast on all sides. Be patient with it. There is no specific amount of time to do this for (I would guess 1-3 minutes per side), just try to get as much of the outside browned as possible. Those dark brown parts on the outside are delicious, so the more you get the better. 5. When all sides are brown, transfer the roast to a slow cooker. 6. Turn the pan on the stove to low heat. Add the wine to the pan. Stir around the bottom of the pan for about 1 minute trying to loosen as many of the flavorful bits as you can. 7. Pour the contents of the pan over the roast in the slow cooker. You will want to have at least ½ inch of liquid in your slow cooker (this can vary depending on its size) or the pork could dry out. If the pan juices do not provide ½ inch of liquid, add up to 1 cup of beef broth to the slow cooker. 8. Cook on low for 6-8 hours. 9. The pork is done when you can easily pull it apart with a fork. At that point, I pull out chunks of the roast onto a cutting board, pull them apart with two forks, then throw them back into the crock pot with the remaining liquid to keep it from drying out. 10. Make the cilantro lime rice: Bring 2 cups of water to boil, add white rice and a sprinkle of salt. Reduce heat to low and cook until rice is tender, about 15 minutes or according to package instructions. Add chopped cilantro, juice of lime, and salt to cooked rice. 11. Assemble rice bowls. 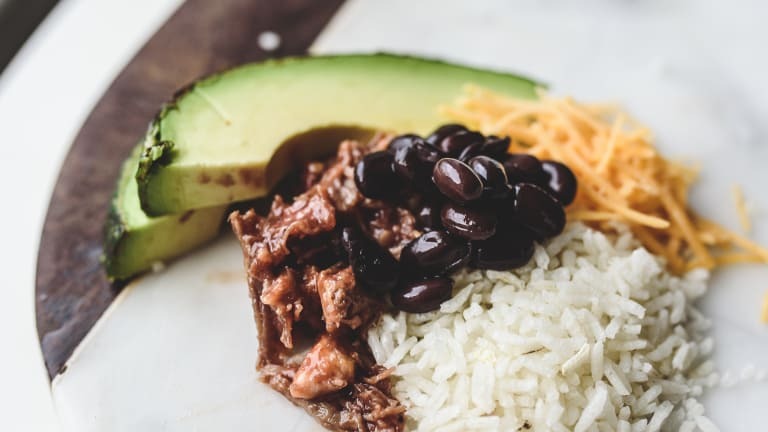 In each bowl, spoon in some cilantro-lime rice and top with the pulled pork, black beans, and other toppings.